Unique Doberman Gifts for you or that someone special. All of our Doberman products are handmade in our Northern California studio. Select from a growing assortment of pottery shapes and have them decorated with your favorite version of Doberman Pinscher. We currently offer Doberman gifts with black and rust Dobermans and red Dobermans. 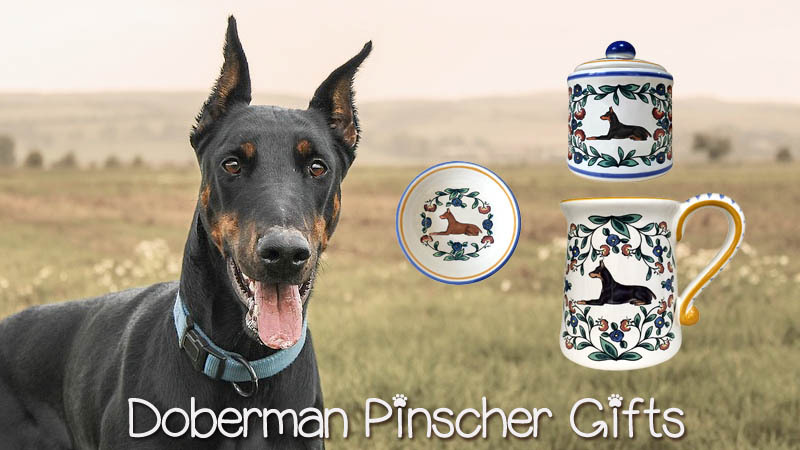 If these standard versions aren't specific enough, you can have your pottery customized with your Doberman's colors and patterns by selecting the "custom" option on the item's page (an art fee applies). Our Doberman products feature a Doberman, surrounded by a colorful floral pattern and accented with hand painted stripes of cobalt blue and golden yellow. While our items may look delicate, you can rest assure that our stoneware Doberman gifts are very durable, so you may microwave and dish-wash them to your heart's content without worry. Doberman Pinschers have a proud, aristocratic look about them - a look that commands respect. They make very good guard dogs, and what comes to mind are Zeus and Apollo from Magnum PI. It was great how "the lads" were so obedient to their master, Jonathan Higgins, but were always chasing Magnum away. The breed originated in Germany over 100 years ago. A German Tax collector, named Louis Dobermann, developed this breed from the Rottweiler, German Pinscher, Weimaraner, English Greyhound and Manchester Terrier. Today the Doberman is used as a service animal and companion all over the world. Have a look at our uniqe Doberman Gifts – we're sure you will find a very special gift for yourself or the Doberman lover in your life.